The Year of Mercy began in the Diocese of East Anglia on Sunday December 13 with Bishop Alan Hopes opening the Holy Door at St John the Baptist Cathedral in Norwich and inviting the 500-strong congregation, which included representatives from every parish in the Diocese, to walk through it with him. A second Holy Door was also opened at the Slipper Chapel at the National Shrine of Our Lady in Walsingham by Shrine Rector, Mgr John Armitage. Pope Francis began the Jubilee Year of Mercy, which will end on November 20, 2016, by opening a Holy Door at St Peter's Basilica on December 8. 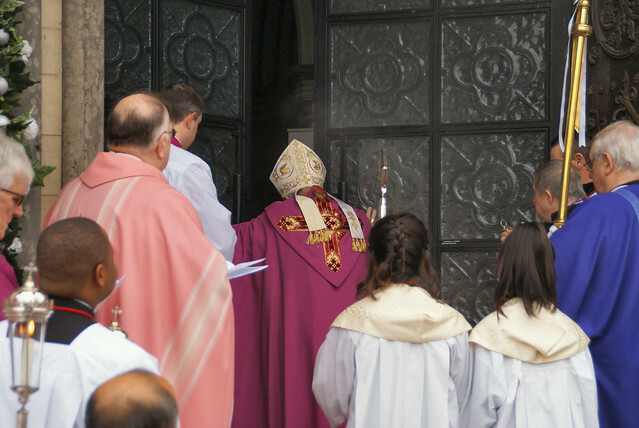 The opening of Holy Doors is an ancient tradition in the Catholic Church. For centuries it has marked the start of a Jubilee Year. During Emperor Constantine's time in the fourth century, Christians could claim "sanctuary' and immunity from punishment if they crossed the threshold of the main doorway into the Lateran Basilica in Rome. Speaking in a Catholic Bishops' Conference Advent podcast, Bishop Alan said: "The Year of Mercy is a wonderful opportunity to reflect on the whole idea of mercy both in the scriptures and in the liturgy of the church. And particularly the way in which compassion, love and mercy should be part of the church's pastoral care of the people of God and those on the margins. "The main Holy Door within the Diocese at the Cathedral of St John the Baptist in Norwich will be open all year for people to make pilgrimage and walk through it. "Going through the Holy Door is such an important thing. It is the opening into the very heart of God's mercy really. People will be encouraged to make the pilgrimage through the door, make their confession (there will be priests in the Cathedral to hear them), and think about some of the spiritual and corporal works of mercy that they can carry out in their own lives." Bishop Alan also revealed that during the year he will be visiting each of the 11 prisons across the Diocese to celebrate Mass and the Sacrament of Reconciliation with the prisoners. "One of the most beautiful things that Pope Francis said was that prisoners, who are obviously not able to make a pilgrimage to a Holy Door, could treat the door of their cell as the door of mercy," said Bishop Alan. "I hope that we Catholics will invite those who have not been to church for a very long time, and those who don't believe, to come and explore this whole area of mercy and see what we are doing and, who knows, they may encounter the Lord Jesus Christ in a new and exciting way in their own lives." The year is also being marked in Walsingham according to Julian Foord, pilgrimage coordinator: "A spiritual pathway of devotions has been established including the Stations of Mercy. Special prayer cards have been produced for each of the seven elements of the pathway and there are display boards in the shrine grounds to aid devotion. It is anticipated that the Year of Mercy will attract a large number of pilgrims." You can read Bishop Alan’s homily at the service here. If you would like to listen to the rector's homily visit the shrine website www.walsingham.org.uk where the daily pilgrim Mass is streamed.